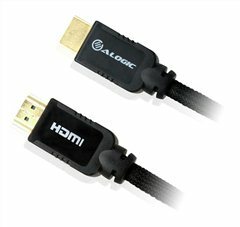 The ALOGIC HDMI Cable with Active Booster Male to Male provides an ideal solution to overcome limitations of a normal HDMI cables and transmit HDMI signal over long distances*. This ALOGIC cable has inbuilt booster chipset to enable transmission of HDMI signal without any loss over long distances. The chipset is built into the connector which males the cable easy to install in limited space and provides a uniform outer diameter for a cleaner install. * The cable is uni directional and will only work when the rights ends of the cable are connected respectively to source and display. The smaller end connects to the source (Computer DVD Player etc) and the larger end with the chipset connects to the Display (HD TV Projector etc).